Home > News and Videos > News > 300 Minis head for the hill! 300 Minis head for the hill! Over 300 of these iconic cars took place in this year's Mini Invasion, a road trip that saw owners drive en masse from Toronto or Montreal to Ottawa. It may be one of the smallest cars on the road, but as Mini owners can attest, it's definitely the most fun! Over 300 of these iconic cars took place in this year's Mini Invasion, a road trip that saw owners drive en masse from Toronto or Montreal to Ottawa. After a celebratory party on Saturday evening at Domtar Industrial Lands, owners reconvened early on Sunday morning at Mini Ottawa for a farewell breakfast and photo. 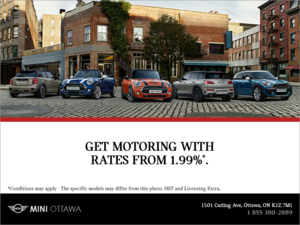 From a neon pink convertible to original British coopers, every model and colour was represented in the parking lot of Mini Ottawa as the Mini Invasion landed. With drivers coming from all over Ontario and some as far as New York state, the farewell sendoff was a chance for participants to admire their fellow invaders cars and share their road trip stories. 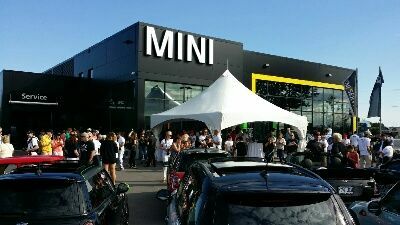 Owners mingled and chatted while viewing the beloved Minis, all wearing their Mini Invasion 2015 'Head for the Hill' T-shirts. After enjoying a breakfast provided by Tulips and Maple catering, Mini Canada's Brand Communications Manager, Steve Ambeau, gave a short speech thanking all the participants for coming along for the ride and to Mini Ottawa for hosting the breakfast. All the invaders then gathered at the front of the dealership for a group photo to commemorate the trip, before starting their journey back home.